The Acropolis in Athens, Greece, has had a long history of human occupation. Over the course of millennia, the outcropping of rock that dominates the ancient city has been frequently reconfigured (the north side of the Acropolis is seen at the left; image © 1977 Donald H. Sanders; used with permission; hover over to enlarge). At the same time, the top of the outcrop has seen a myriad of buildings, sculptures, and miscellaneous monuments of numerous kinds. The history of the complex of structures and artwork that crowned the Acropolis has been and continues to be studied by students and scholars. Analyses of the history and organization of the monuments on the Acropolis continues to fascinate (for site location, see GoogleEarth map below). 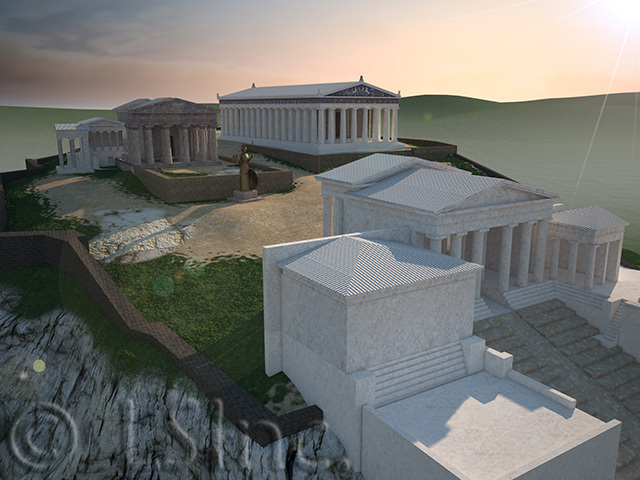 LEARNING SITES has been asked four separate times to work on modeling aspects of the Acropolis, resulting in three progressively more detailed 3D visualizations (a rendering from one such model is seen at the left; hover over to enlarge). Various images extracted from our 3D models of the Acropolis (including renderings, an animation, and the virtual world) are available for purchase from the Institute for the Visualization of History (www.vizin.org; click on the Products button). The images are ready to use in any noncommercial educational context. The map is oriented over the Acropolis (whitish area around the pushpin). current remains on the hill (the pin points to the east porch of the Parthenon). 1989 Athenian Red Figure Vases: the Classical Period. New York: Thames and Hudson. 1976 The Parthenon and the Mycenaean City on the Heights. Publications of the National Museum, Archaeological Historical Series vol. 17, Copenhagen: National Museum of Denmark. 197 The Excavation of the Athenian Acropolis 1882-1890. Copenhagen: Gyldendal. 1998 The Ancient City: life in Classical Athens. Rome, Oxford: Oxford Univ. Press. 1975 The Architecture of Ancient Greece. NY: Norton & Co., reprint of the 1950 3rd rev. edn. 1886 (published 1887) Antike Denkmaeler, vol.1. 1994 Acropolis Restoration: the CCAM Interventions. London: Academy Editions. 1999 The Athenian Acropolis. Cambridge: Cambridge Univ. Press. 1906 Die Ausgrabung der Akropolis vom Jahre 1885 bis zum Jahre 1890. Athens. 1949 Les réproductions de statues sur les monnaies grecques. Liège: Presses universitaires de Liège. 1993 The Sanctuary of Athena Nike in Athens : architectural stages and chronology. Princeton, NJ: American School of Classical Studies at Athens. 1927 The Erechtheum, Measured, Drawn, and Restored. Cambridge MA: Harvard Univ. Press. 1888 Investigation of the Principles of Athenian Architecture. 2nd ed., Washington DC: McGrath. 1995 Architecture and Meaning on the Athenian Acropolis. Cambridge: Cambridge Univ. Press. 1940 "The Setting of the Periclean Parthenon," Hesperia Supp. III, ASCS. 1936 "The Periclean Entrance Court of the Acropolis of Athens," Hesperia vol. 5:442-520. © 2003-2019 Learning Sites, Inc.